Janet L. Yellen, the Federal Reserve chairwoman, said at a congressional hearing that the Federal Reserve was in no hurry to raise interest rates. Video by Reuters on Publish DateFebruary 24, 2015. Photo by Stephen Crowley/The New York Times. WASHINGTON — Janet L. Yellen, the Federal Reserve chairwoman, told Congress Tuesday that the Fed was pleased with recent economic growth, convinced there was room for improvement and still pondering when to start reaising interest rates. In testimony before the Senate Banking Committee, Ms. Yellen advanced the Fed’s slow -motion progress toward raising its benchmark interest rate, describing for the first time how the central bank plans to signal that the moment is approaching. But she said that patience remained the central bank’s watchword. Ms. Yellen’s careful performance reflected the Fed’s desire to delay decisions about its next steps as it seeks greater clarity about the health of the economy. In response she drew gentle prodding from some Republicans concerned the Fed will move too slowly, and from some Democrats who have the opposite concern. Senator Richard Shelby, the Alabama Republican who chairs the banking committee, questioned whether the Fed, by continuing to hold short-term rates near zero, is blowing bubbles in financial markets and losing control of inflation. Senator Sherrod Brown of Ohio, newly installed as the ranking Democrat on the committee, countered that concerns about inflation were misplaced. Ms. Yellen, seeking to hold her middle ground, cautioned Republicans that the Fed still saw a need for its stimulus campaign and warned Democrats that the end was approaching. “We do have an economy that fortunately appears to be recovering and we have to be forward looking in setting monetary policy but I want to assure you that we do want to see that recovery continue,” Ms. Yellen said. She added that policy is very accommodative and will remain so even as the Fed starts to raise rates. Much of the hearing was devoted to proposals that would reduce the Fed’s policy-making autonomy, particularly a Republican proposal known as “Audit the Fed” that would subject its policy making to reviews by the Government Accountability Office. Ms. Yellen brandished a copy of the Fed’s audited financial statements to make the point that the central bank’s books already are examined by accountants. Reiterating her opposition to expanded oversight, she questioned whether such a measure would have discouraged then-Fed Chairman Paul Volcker from raising rates in the 1980s, a painful process that produced a sharp drop in inflation. She dismissed several other proposed reforms — including changes in the structure of the policy-making committee — as unnecessary or counterproductive. Mr. Shelby said in his opening remarks Tuesday that the Fed should be subject to “additional oversight by Congress and further reforms,” and that the committee would hold a hearing to discuss proposals next week. Ms. Yellen offered an upbeat assessment of the economic recovery, echoing the statement the Fed issued following its most recent meeting in January. “Considerable progress has been achieved in the recovery of the labor market, though room for further improvement remains,” she said, according to a copy of her prepared remarks provided to reporters in advance of her testimony. She added that the collapse of global oil prices appeared to be “a significant overall plus” for the domestic economy, supporting more household spending. Ms. Yellen cautioned that the weakness of other developed economies could slow growth in the United States. On the other hand, she said, the recent efforts by policy makers in those countries – including the stimulus campaign announced by the European Central Bank – could provide a boost to the United States, too. Some Fed officials expressed concern at the Fed’s most recent meeting in January about sluggish inflation, and the decline of some measures of inflation expectations. Just as too much inflation can disrupt economic growth, so can too little. Until recently, the Fed has maintained an official view that the weakness is a temporary affair. Ms. Yellen said this was still true, “as best we can tell,” but she acknowledged that some of the recent downturn may not reverse quickly. 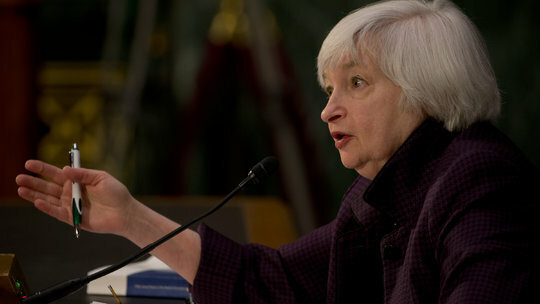 Ms. Yellen also reviewed the signals the Fed intended to use in the coming months. She said that the presence of the word “patient” in the Fed’s latest policy statement means that it does not intend to raise its benchmark interest rate during the two meetings following the release of that statement. If the word appears in statement issued after the Fed’s mid-March meeting, it would indicate that the Fed does not intend to raise rates until its scheduled meeting at the end of July, at the earliest. “If economic conditions continue to improve, as the committee anticipates, the committee will at some point begin considering an increase in the target range for the federal funds rate on a meeting by meeting basis,” Ms. Yellen added. 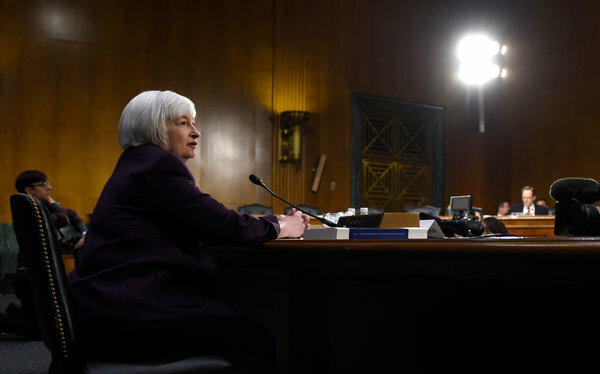 The Fed will change the wording of the statement when that happens, she said, adding that the eventual move to a shorter decision-making horizon should still not be taken to indicate that the Fed would then move quickly to raise rates.